The onboard microphone aren't necessarily terrible, but it could use a little improvement, and up until now that wasn't possible. 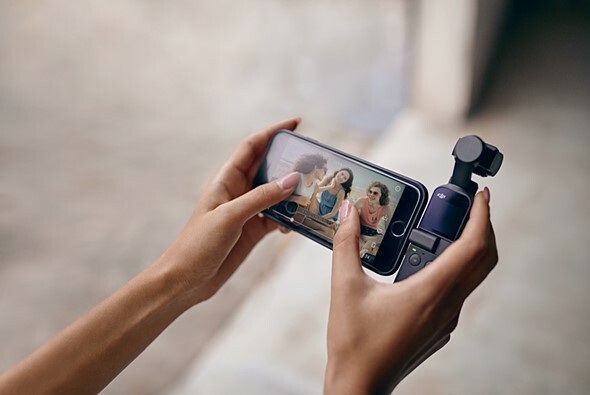 After many hints that one was on its way, DJI has finally released a 3.5mm microphone adapter for the Osmo Pocket that plugs directly into the camera's USB Type-C port. The adapter works with TRS 3.5mm connectors. In case you've never noticed, 3.5mm jacks will have either one, two or three black bands wrapped around the male connector. Cable Chick has a great explainer on the differences, but a brief synopsis is that one band means it's a TS connection that supports mono audio, two bands means it's a TRS connection which supports stereo audio and three bands means it's a TRRS connection which supports stereo audio plus a microphone. If you're using the Osmo Pocket 3.5mm Adapter with a TRRS connection, you might also need to purchase an additional adapter, such as this one offered by Rode. The DJI Osmo Pocket 3.5mm Adapter is available now at B&H and the DJI Store for $39. The phone attaches to the side. The USB-C port is k the bottom. This little camera ended up being such a disappointment. I owned for a couple of months but ended up selling and just using my phone and GoPro 7. Out of interest what aspect was such a disappointment? Video quality was just ok. Focus constantly hunts and jerky looking video on occasions. It’s just too small. Needs a one inch sensor. It has better low light performance than either iPhone or GoPro and more detail. If you need a larger sensor it'll probably be within a small 'proper' camera with IBIS such as a LUMIX GX85. Was the footage juddering when displaying 30 or 60fps footage? - or with 24 or 25fps - I only ask as to playback 24 or 25fps footage you need a monitor with refresh rates at multiple of the fps. Most laptops inc MacBook Pro will exhibit juddering when displaying 24/25fps due to fixed 60Hz refresh rate. No. It an adapter that is proprietary on the Osmo Pocket. The adapter is ISB-C which is universal but a camera would still have be programmed to accept input via the USB port. I think its price punches well above its weight too. why should it be through an adapter? What's wrong with separate dedicated 3.5mm input? requires a pre-amp - which takes up space - either inside a larger body or as an add-on. Ideally DJI would redesign the OSMO pocket slightly larger, easier to hold, larger battery and a built-in mic pre-amp. The microphone is VERY badly placed on the OSMO pocket. It should have been put on the top of the main body and not at the bottom left. The way I hold my pocket, I end up either completely or partially blocking the mic most of the time. They must have field tested this device using only small Asians. 'bottom left'? - more like near / just under the centre. I presume they didn't place it at the top as it would have picked up the gimbal motors. Main issue is that is faces 'you' - the camera-man, not ideal if you want to record someone talking in front of you. Not on my Pocket it isn't. It is to the left of the USB-C port, just as you get to the start of the rounded corner. Which is nowhere near centered, be it left/right or front/back. There's 2 microphones, one under the lower corner, one beside the status led half way up. Never noticed that. I guess that explains why the audio is so crap on the Pocket, as that is where I usually place my thumb while shooting, with the bottom in the palm of my left hand. As I said, very poorly designed. One of the best time-lapse camera ever made (fine RAW, motorized gimbal, up to 8 sec exposure, no mechanical shutter), but for filming/vlogging exist many better choices. What is better for filming/vlogging with comparable size and gimbal? ...yet there are no practical solutions for GX80, GX9, GM and GF cameras of panasonic! $3 to make and sell for $39 but it is better than the Gopro audio adapter for $60, DJI is the better of the two evils! It is not better: 1. The GoPro adapter is stereo, the DJI adapter is mono. 2. The GoPro adapter also has a USB-C port for charging simultaneously. The DJI one does not. You have no idea what you are talking about. I have both. Is the DJI adapter really mono? I thought it was stereo. TRRS (=Tip/Ring/Ring/Shield) is definitely stereo. for that price, but it is definitely better than the built-in mic. I bought this Dji, but it was a frustrating experience because I couldn’t figure out where to fix the props to get this thing flying in the air. They need to make it larger on the next one so they can include Bluetooth and mic port. I love mine but these are more necessary considering the device is tiny as it is. There is an expansion kit with Bluetooth and WLAN in a tiny stand plus a control wheel for the tilt axis. Mine will land tomorrow if tracking is right. It's not even stereo, TRS or no TRS. Amazing. Au contraire, it is stereo. Funny this. The osmo is like those magazines where each week you get a new part to build a ship. You buy the first few editions for a reasonable price, but then they harshly raise the price for new editions/parts. By the end you will be paying a small capital to get your model ship completed. It seems like DJI is also making folks bleed to complete their osmo. There will be cheap parts on Amazon very soon for it. 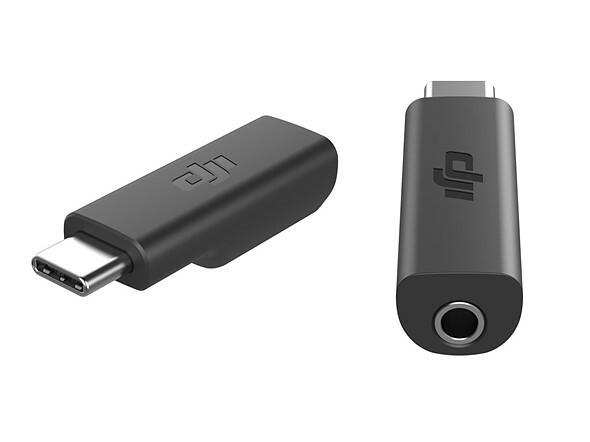 Out of curiosity, I just tried using the USB-C to 3.5mm adapter that came with my Pixel 3 on the Osmo Pocket, and it's a no-go. It's been known that other adapters don't work. Also the firmware didn't support audio-in. I wonder if you tried with the latest firmware. 101 dealers show adapters "working" (haha) with OP, but THEY DO NOT. Now wait one more month for the rest of the missing parts and finally we have a real vlogging camera. $57.72 Canadian with shipping. Uh, no. I'll use a lav into my smartphone and sync in post. pay $30 from China dealers with free shipping! 28€ from China dealer - free shipping.